Northland Environmental and its owner, PSC Environmental Services state that they will remove hazardous chemicals and flammable storage from 60 high schools and middle schools within a 50 mile radius of its Providence facility – where the violations occurred. Flammable material buildings provide a safe and secure way to store hazardous materials and flammable hazmat. The commercial waste handler in Rhode Island will pay $58,278 and spend $252,152 to clean up hazmat and flammable storage out of 60 schools in Road Island and Massachusetts. The commercial waste handler was said to have violated state and federal hazardous waste laws, in accordance with the EPA, near a facility in Providence, RI. Hazardous and non-hazardous waste will be cleaned up and disposed of properly by the companies that have been charged and they will perform hazardous waste training for science and art teachers, while supplying the schools with flammable storage cabinets, eye wash stations and showers for classrooms where hazardous chemicals are handled. EPA officials stated that they acted quickly after the discovery of the improper chemicals. 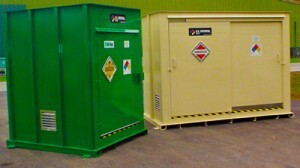 Flammable storage cabinets and protection is necessary when handling or storing flammable storage. The clean up task will constitute a neat and thorough team effort that will involve removing outdated and unused chemicals from the school (the school will not be charged). It is not uncommon for science departments to have unused and outdated chemicals stored in classrooms, and officials urge schools to monitor and maintain the chemicals that are in the classrooms. Proper disposal of outdated or unused flammable storage can offer a safe and protected environment for students to learn in.